Samsung new Galaxy S8 smartphones are selling like hot cakes all over the world. Although it's hard to tell how many iPhone users have made the switch to Samsung's new flagships, the South Korean company wants to make sure the percentage is high. Smart Switch, Samsung's software that allows customers to seamlessly switch from another smartphone to a Galaxy device, has just received a new home. No new features or improvements have been added to the software, but Smart Switch now has a redesigned website that's meant to appeal more to Apple fans. Those who use Smart Switch to upgrade to the new Galaxy S8 or S8+ will find that Samsung’s latest flagships make managing important data and preserving digital memories even more intuitive. Still, regardless of whether you'll be upgrading from iOS, Windows Mobile, BlackBerry or another Android device, Smart Switch allows you to transfer all your photos, videos, contacts, music and more on your new Galaxy device. The 3-step process is easy to follow and thoroughly explained on the new Smart Switch website. Keep in mind that the software is fully compatible with the Galaxy S II and newer devices running Android 4.0 and up. 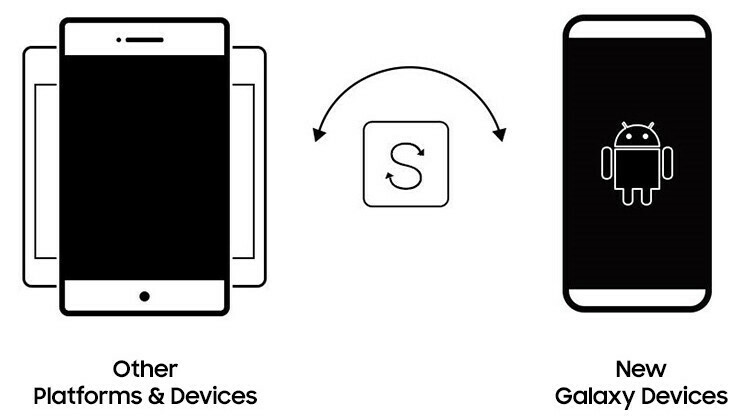 However, some Android devices might not support wireless transfer, thus rendering Smart Switch useless. Not for me. Samsung doesn't give me a compelling reason to switch to their Galaxy devices. How exactly did the author come to the conclusion that this redesigned website was merely for apple users? I'm sensing arrogance and clickbait with the title. Yes they are. ALL OF THEM!!!!! I don't see how the new website layout for Smart Switch is designed for Apple users specifically. Because it isn't. Its just PA's typical bullsh|t. No thank you. Lagwiz and Samsung bloat is a deal breaker for me. Look at all those concerned ifans lol. Not interested in a Samsung phone as long as they continue to run Android. Not prepared to downgrade my OS from iOS. Haha. The fact you think Android is a downgrade from IOS, means you have a lot to learn. IOS with its limited BS is far more of a downgrade. Enjoy your overpriced app launcher! Even though some Android devices can't use the wireless transfer, Samsung's latest phones come with a USB adapter, so you can plug in any phone and so the switch. It's amazing how you losers don't provide any facts when it comes to Samsung products and how they make doing things easier for potential customers. In fact their website shows a graphic for the USB connector. Also the Smart Switch is used to switch from ANY phone. And with the USB adapter you can connect ANY phone and use this application. The site is not specific to Apple or the iPhone. Its just PA's typical bullsh|t. "However, some Android devices might not support wireless transfer, thus rendering Smart Switch useless." You don't have to transfer your data wirelessly. So, not useless at all.